As schools and other organizations deploy more netbooks, tablets and notebooks, security and recharging are an increasingly important concern. Datamation Systems has introduced a compact, secure and affordable storage solution for this growing need: the new DS-NETVAULT-M. 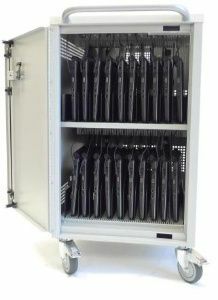 The new cart secures, stores and recharges from 14 to 24 netbooks, notebooks or tablets, depending on their dimensions and battery sizes. It has a small footprint, is easy to move, and the three-point locking system protects equipment from theft, vandalism and unauthorized access.